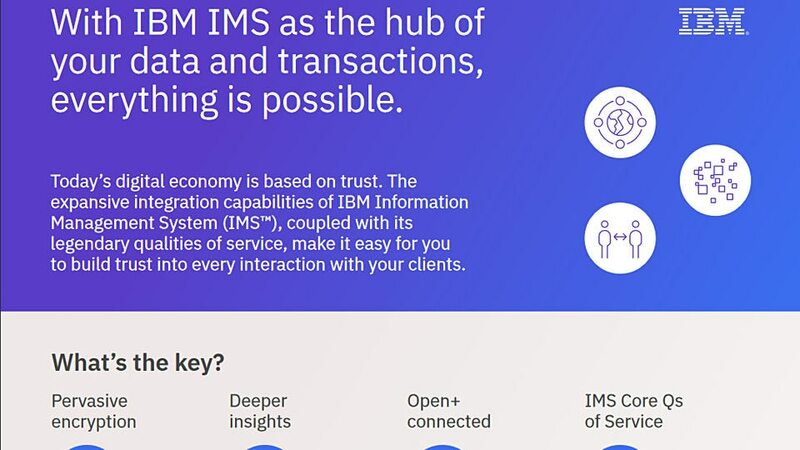 IBM® Information Management System (IMS™) is already the trusted name in transactional databases on IBM Z®. IMS 15 builds on that trust. It provides encryption and mobile auditability to help minimize risk, while processing up to 265 billion transactions per day. It delivers dynamic development and enhanced tuning and performance to drive business efficiency. All part of an open, connected environment to foster innovation and generate returns using APIs. Encrypt IMS and IBM Db2® data with minimal CPU overhead, zero app changes and no SLA impact. Track original user identity from mobile and distributed clients and use RACF® password enforcement. Simplify and expand Java® development with dynamic configuration of variables and options to improve security, flexibility and control. Track JVM usage statistics for improved systems management. Optimize your IMS investment and generate returns from APIs. IMS applications can easily consume REST APIs to help you rapidly introduce new apps and services. Get more from IMS with IMS Connect and programming enhancements such as a Common Queue Server automatic structure checkpoint, support for growing client workloads and more. Make digital transformation pay off with IMS. According to IDC, early adopters of a connected mainframe strategy have achieved more than 300 percent return on investment. Encrypt APIs nearly three times faster on IBM z14 than alternatives on compared x86 systems. IMS 15 and IBM z14 offer an open enterprise cloud designed to be easy to extend, connect and manage.